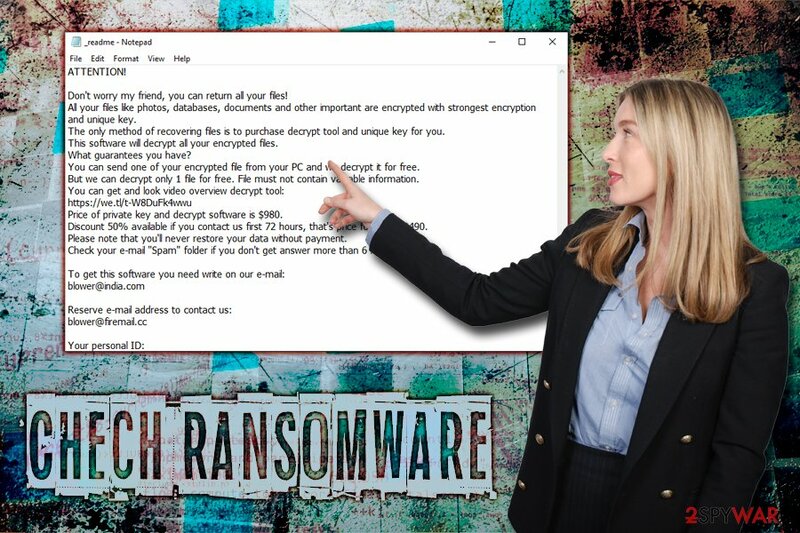 Chech file virus is malware that belongs ransomware-type category and was first spotted by security researchers in late March 2019. It belongs to STOP virus family and uses a sophisticated AES encryption cipher to modify files that are most commonly used, such as .jpg, .doc, .pdf, .mkv, .xtml, .txt, and many others. The altered structure can also be noticed by an extension .chech – it will also prevent users from opening any of the personal data. Once done with the encoding process, Chech ransomware will contact a remote C&C server and drop a ransom note _readme.txt (other subgroups also use this file, including Promos, Kroput, Blower, etc. ), which asks users to contact crooks via blower@india.com or blower@firemail.cc and then pay $980 in Bitcoin for the file decryptor. While this variant is not decryptable, experts do not recommend paying bad actors and instead focus on Chech ransomware removal and alternative file recovery methods. While there are multiple different infiltration methods that hackers use to propagate Chech file virus, it is most likely that users get infected with the threat after downloading and installing pirated software or its cracks. Additionally, opening and extracting attached files or clicking on links inside a phishing email is not a good idea either. 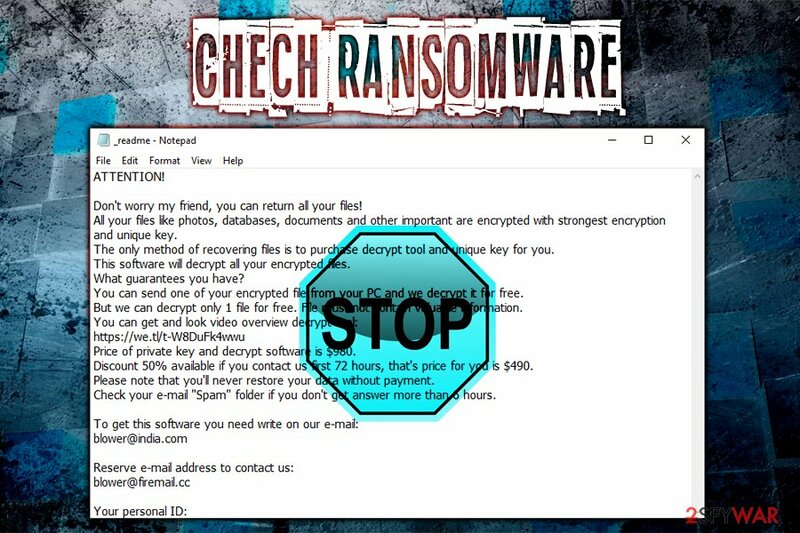 Check our second section of the article if you want to know ways to protect yourself from Chech ransomware and similar threats. As soon as Chech virus enters the computer, it performs a variety of changes to Windows system configuration, such as deletion of Shadow Volume Copies, establishing new scheduled tasks, modifying the registry, etc. The encryption process changes files as follows: a picture.jpg is turned into picture.jpg.chech. You might end up getting scammed, losing both of your files and money. Therefore, we highly recommend users to remove Chech virus instead and never contact the crooks. This can be accomplished with reputable security software, although you might have to enter Safe Mode with networking for that. After you complete the Chech ransomware termination procedure, make sure you scan your PC with Reimage – it will get rid of the virus damage and restore Windows registry, although it will not decrypt files. For that, you need to use specific software – you can find download links and usage instructions in our removal section below. Be aware that some STOP ransomware variants (.promorad) was simultaneously distributed with AZORult malware – a Trojan that is capable of stealing user passwords, cookies, online banking information, and other sensitive details. Thus, if you got infected with Chech ransomware or any other variant, make sure you change your passwords and check your bank account to make sure no illegal transactions were performed. As we already mentioned, malware authors often employ a variety of different methods for distribution. In STOP ransomware case, users are more likely to be infected while downloading pirated software or cracks/keygens from sites like Crackithub.com. In general, installing cracked software is illegal and might land you in jail in some cases. While you might get away with facing the consequences for copyright infringement, malware infections while visiting torrent and cracked software sites is highly likely. Therefore, it is highly advisable staying away from high-risk sites. If you download anything, make sure you scan executables with tools like Virus Total or your anti-virus engine. Speaking of the latter, it is extremely important to keep anti-virus software installed on your device at all times. Additionally, you can also employ such tools like anti-exploit, real-time internet protection, ad-blocker, Firewall to maximize your protection. It is best not to consider paying the ransom and instead focus on the Chech ransomware removal process. The initial infection might be incredibly overwhelming to users who never faced crypto viruses before, as, unlike most silent threats, ransomware makes sure that the victim knows about what happened (hence the ransom note, popping windows, wallpaper change, etc.). However, it is vital to stay calm. Currently, there is no official decryptor available for Chech virus. Nevertheless, as practice had shown, security researchers are continually working on decryption tools for other STOP variants, and many of them are already decryptable. As for now, remove Chech ransomware from your machine with anti-malware software and attempt to recover data by using alternative methods – you can find all the instructions below. Log in to your infected account and start the browser. Download Reimage or other legitimate anti-spyware program. Update it before a full system scan and remove malicious files that belong to your ransomware and complete Chech Ransomware removal. When a new window shows up, click Next and select your restore point that is prior the infiltration of Chech Ransomware. After doing that, click Next. Once you restore your system to a previous date, download and scan your computer with Reimage and make sure that Chech Ransomware removal is performed successfully. Guide which is presented above is supposed to help you remove Chech Ransomware from your computer. To recover your encrypted files, we recommend using a detailed guide prepared by 2-spyware.com security experts. Data Recovery Pro is a professional tool used to restore files that were corrupted or accidentally deleted. In some cases, this software can help when dealing with ransomware locked data. If you had System Restore enabled prior to Chech ransomware attack, you might be able to recover separate files with Windows Previous Versions Feature. If Shadow Volume Copy deletion procedure failed, you have a chance at recovering your data with ShadowExplorer. This entry was posted on 2019-03-27 at 07:40 and is filed under Ransomware, Viruses. You can quickly scan the QR code with your mobile device and have Chech Ransomware manual removal instructions right in your pocket. How did you remove Chech Ransomware?